The Daughters of Divine Providence have been in the Yucatan in Progreso and Oxkutzcab (pronounced Osh-kutz-cab), Mexico since 1993. Their mission project was to minister to the people's needs and present conditions. Eleven Sisters presently serve three communities, tending to the physical and spiritual needs of villagers by working in parishes, helping priests, preparing catechists and people to work in liturgy, teaching catechism, preparing Catholics for their sacraments, doing outreach in neighborhoods and tending to the medical needs with volunteers through a dispensary and clinic. Building an ‘Internata,’ a home away from home, for the children of the town was a later missionary opening. Education opportunities for the town children are sparse, inadequate or lacking. They are locked in poverty. Children do not attend school regularly because of lack of interest on the parents part and on the lack of attendance of a teacher, which is a hit and miss situation at the best. 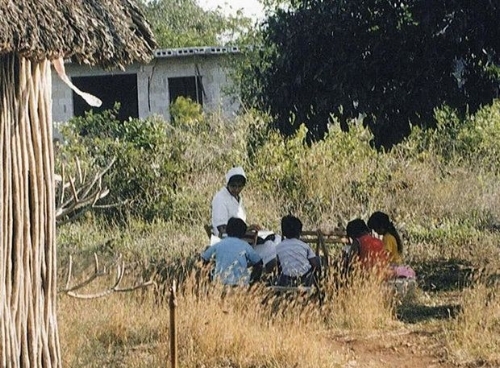 The Sisters who run the "Internata" facilitate the success of each student in their care by providing necessary food, clothing, school fees, supplies, homework assistance and encouragement to continue their education. The children, in turn, work as a family to maintain the Internata and gain a spiritual and moral foundation from the Sisters. The Sisters have the children under their care and guidance during the entire school year. Children return to their families on holidays and summer break, distances permitting. The Sisters work very intensely with the people whom they have grown to love and cherish as God's chosen little ones. The needs are vast, but with God's Providence the Sisters continue assisting the people's needs. As the Sisters observed and listened to the people, it became very clear that a clinic/dispensary was needed. People who need a doctor visit, eye care, dental and emotional assistance was lacking for the town and nearby villages. The Sisters were determined, with God's providence, to address these needs. Volunteers from the Laity association there working with the Sisters began the ground work. The pastor was in full acceptance of the new outreach and offered an unused large room in the church compound. A local doctor, nurse, dentist, and social works heard of this project and willingly volunteered to staff the clinic after their working day was complete. With the help of the Laity association in the United States, with many fund raisings and other donations from friends, the dream became a reality. Many families and people are being helped, God provided. There is a desire to expand this ministry to become "mobile", that is to go out to the distant villages where the people cannot come into the clinic. It is in the works, in God's Provident hands.